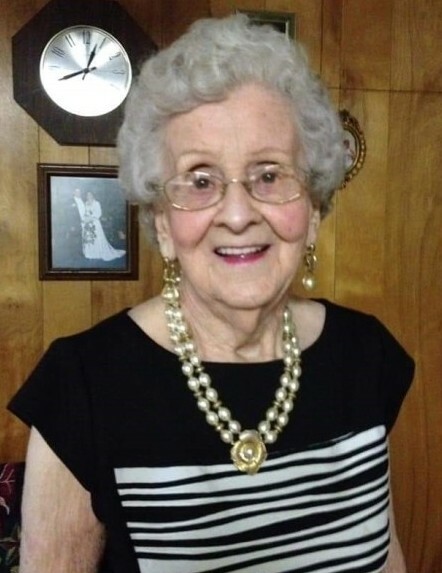 On Sunday, January 13, 2019 we said goodbye to a special lady. Nellie “Nell” Mae Long Landrum, most affectionately known to many as Granny. Visitation will be held Wednesday, January 16, 2018 at Iuka Baptist Church 105 West Eastport Street Iuka, MS beginning at 10:00 a.m. until noon. Funeral Services will follow visitation beginning at noon. Burial will be in Oak Grove Cemetery, Iuka, MS. Officiating will be Bro. Johnny Hancock. She was survived by her husband of 73 years, 2 children, 3 grandchildren and 8 great-grandchildren. Words that we would use to best describe her are… listener, encourager, patient, loving, kind, satisfied, confident, optimistic, edifying, dedicated, loyal, honest and Christian. Her smile and laughter were contagious and attractive. Her home was warm and wonderful. The love of the Lord was evident in her daily walk. We say goodbye to the very best part of us, the glue, the cornerstone and matriarch of our family. Though she will be sorely missed, we rest assured in the promise that we shall meet again. Pallbearers: Todd Nelson, Dean Nelson, Adam Nelson, Abe Nelson, Gunner Ford, Garrett Nelson, and Luke Nelson.